I just may lose a few folks with this post, but the ones that stay obviously have a sense of humor. 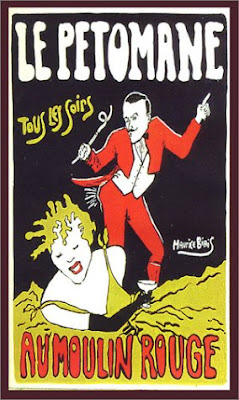 I was discussing the history of various spices and pastries (food geek that I am) with a Canadian friend the other week and she giggled as she told me about Pets De Soeurs. It seems these little crispy balls of light fried sweet bliss actually translate to mean "Farts of Nuns". Now, having grown-up beside my grandparent's survival farm in NC, I assumed I had heard just about every un-savory term for food ever used, but I was wrong. A quest followed. I researched the history of...these little...puffed fartlettes and it took me to some very odd places. The French verb meaning "to fart" is peter; thus; Pets. The french word Soeur means Sisters (or Nuns in this usage, and they are sometimes called Pets De Nonne). To some of you, this is old news, but it wasn't to me. I decided making these were a must and since it involved Choux Paste and I didn't really want to look up a recipe, I went to Ruhlman's Ratios. Ironically, if there were two people who would definitely laugh at a fart, it would be "the bad boys of the kitchen": Michael Ruhlman and Anthony Bourdain. I'm giant fans of those two, both their cooking and their natures. Ruhlman, especially, because he actually looks like he's safe, but...so bad (in a good way). Of course, on Ruhlman.com, there was not only an extensive posting on Choux Paste, it even mentioned these Pets de Soeur, and ranted about how easy it is to make your own choux pastry. I used the ratio: 2 part liquid: 1 part butter: 1 part flour: 2 part eggs to make about a dozen of these. I added a little zest and a bit of vanilla bean to the pastry when I beat the eggs in. When the dough was pasty and thick, I dropped small scoops (using an ice-cream scoop) of the dough into oil that had heated to 350F. That's when I discovered the possible reason for calling these things something that would mean holy farts. About half-way through the process of caramelizing and turning crisp on the outside, these little tuffs of dough give off a tiny explosion of air and double in size. It made me laugh. Okay, I already admitted I'm a geek, but ya gotta laugh, right? How often does food "pet" in the pan? I'm always going over new ways to use Nutella, mostly because of joining this Nutella Challenge idea that Paula at Bell'Alimento came up with a few months ago. So, every month I'm looking for a new way to incorporate that chocolate/hazelnut crazy-good spread (besides just eating it by the spoonful which I also do). 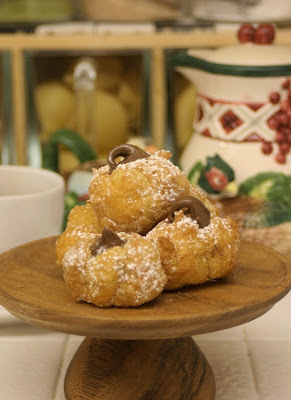 Once I tasted these light and crispy puffs I had made, the serious food work started as I began filling them with Nutella. Great idea! What followed was the not so great idea of eating about 4 of them myself. The rest were consumed by my family so fast I only had a picture to remember them by. 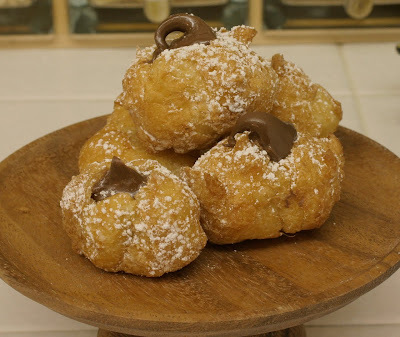 I hope you'll try these, Pets de Soeur or call 'em Nutella Puff Balls if ya want. They'll be eaten faster than you can tell'em what they're called, anyway. In a saucepan, heat and melt a stick of butter (4oz) in 8oz. water (and a pinch of salt). When it starts to simmer, add 4 oz. flour and stir with a wooden spoon very fast. When the dough starts to gather away from the sides of the saucepan, keep stirring for about 2 minutes until the dough gets a bit dryer. Put your dough into your mixing bowl and let it cool for a few minutes. Then add about 4 eggs (each egg is about 2 oz.) just one egg at a time. Inbetween each egg, stir rapidly to really incorporate the egg. Also, add in 1/2 vanilla bean grains stripped (or 1/2 tsp vanilla extract) and 1/2 tsp. orange zest after the eggs. Stir, again to incorporate. The dough should look thick and pasty. Heat a deep saucepan with about 3-4 inches of oil and bring oil to 350F. Drop spoonfuls of dough gently into the oil and monitor temperature of oil. Carefully, using a long utensil, turn dough over to fully cook on all sides. Wait for it, and it will pop to incorporate the air the steam has caused while cooking the butter. 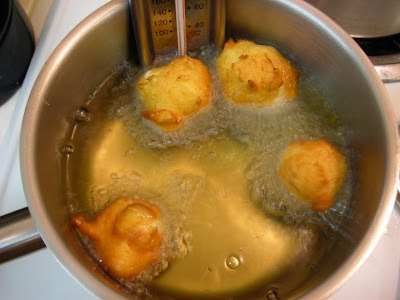 Remove Cream Puffs to drain. After a few moments, cut a small opening in one side and using a pastry bag or just a spoon, fill with Nutella. Sprinkle with Powdered Sugar to garnish and enjoy while warm. Just writing this has made me so hungry. Good Grief, I really am a food geek. This ratio also makes Gougere: just add loosley grated gruyere cheese (instead of vanilla or zest), mix in throughly and bake the scoops on a parchment lined baking sheet for about 15mins at 400F. Also - think about what else you could fill them with... hmmm? This post made me smile... I am a French Acadian Canadian girl who grew up in a French speaking home, and whose ancestors made pettes de soeurs on a regular basis. Traditionally in our region, though, pettes de soeurs were tightly rolled cinnamon rolls baked in a brown sugar sauce. To try to explain the origin and meaning of the name of these pastries would end up being quite a challenge of proper blog comment conversation etiquette, so I will refrain... just resort to using your imagination -- it's just as fun! Mon dieu! These look and "sound" incredible! Loved the story. 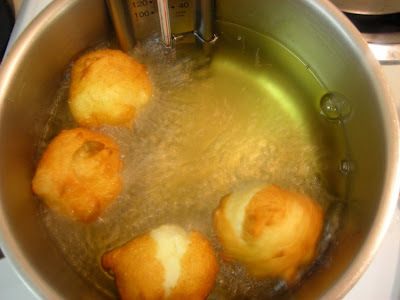 I think we need to get the old fryer out of Erika's basement to make these little "puppies"! Seems like these will be worth the frying effort even from moi the disdainer of all things greezy and fried!